But extensive deforestation and degradation are causing a significant decline in the biological diversity and the ecosystem goods and services provided by them. And, in many African countries there is a notable connection between degradation and the inability of decision makers – and the larger society – to access existing scientific knowledge and innovations that could help reverse the impacts of forest degradation. 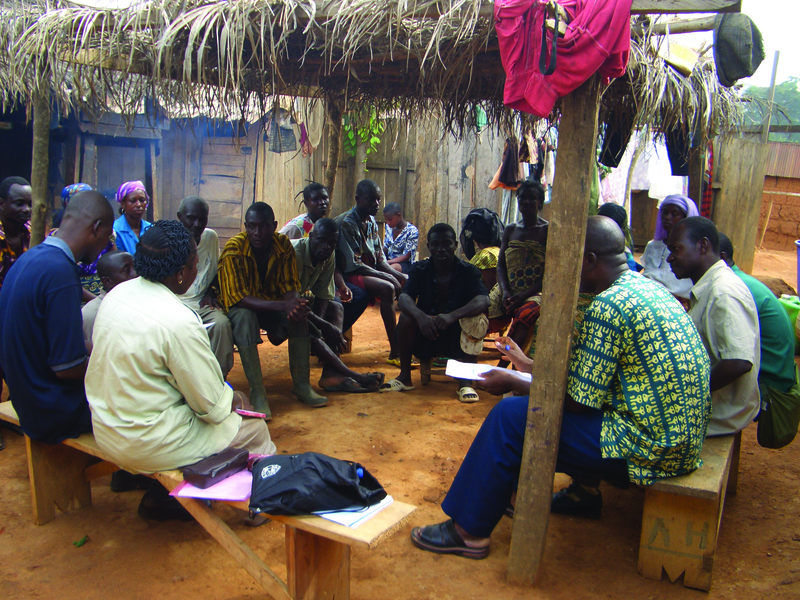 To address this issue, IUFRO, with its partner institutions in four International Tropical Timber Organization (ITTO)-member African countries – Cameroon, Ghana, Liberia and Nigeria – implemented a project to disseminate scientific information. The initiative was supported by ITTO through its Thematic Programme on REDDES (Reducing Deforestation and Forest Degradation and Enhancing Environmental Services from Forests). “Local communities know quite well why their landscape is degraded – but it is hard to address the underlying causes of degradation since this requires changes in various economic sectors involving many different stakeholders,” says Dr. Michael Kleine, IUFRO Deputy Executive Director, and coordinator of IUFRO’s Special Programme for Development of Capacities (SPDC). “By bringing together all local stakeholders and discussing the situation, a better understanding of the complex land use/degradation issues that exist is developed and this allows the development of realistic strategies aimed at addressing those issues,” he adds. A multitude of factors drive deforestation and forest degradation. Within the forest sector, harvesting, firewood collection, excessive grazing and wildfire are primary causes while population growth and expansion of agricultural land for food and biofuels are major external factors. With that in mind, rather than attempting a scattergun approach, the pilot project identified one top priority issue in each country and focused on that. in Nigeria the focus was on raising awareness about forest conservation and environmental quality and allocation of land to communities for intensive farming. The goal of the pilot project was to support efforts to reduce deforestation and forest degradation through the enhancement of socio-economic sustainability and community well-being in forest-dependent areas. The hope is that at the end of the project the people living in the four REDDES pilot areas will see the need for improving land management – mainly through trees – and, in a not too distant future, enjoy better and more diverse food crops, better water quality and more local jobs and income. But, successfully reducing deforestation and expanding the area of rehabilitated forests – which is the main focus of REDDES – requires a wide range of measures at national and local levels.